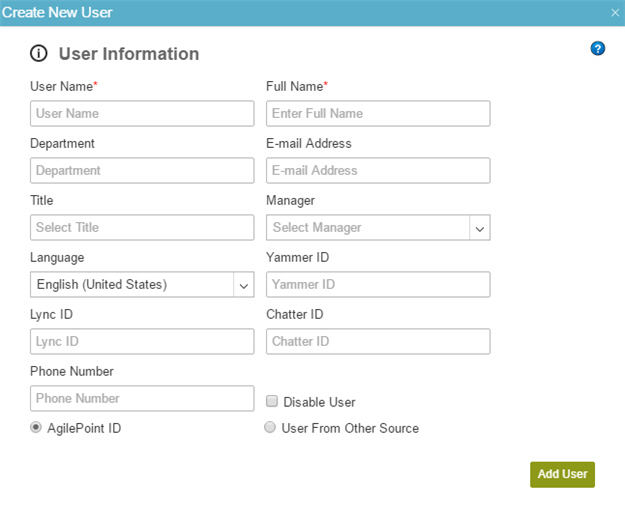 Creates a new user for AgilePoint NX. Specifies your user name in AgilePoint NX. None if you register with AgilePoint ID. If you register with an external authentication provider, this field shows the information from your external account. A text string that can contain spaces. The value of this field is used for the My Department view in the Work Center. For more information, refer to Tasks. Specifies the user's e-mail address. Specifies the job title of the user. The name of your job title. The value of this field is used for the My Direct Team and My Team And Sub view in the Work Center. For more information, refer to Tasks. Specifies the language of the user. A valid 2-letter ISO language code. Specifies the authentication type for the user. AgilePoint ID - The user's authentication type is AgilePoint ID. User From Other Source - The user's authentication type is different from AgilePoint ID. Adds the user to the AgilePoint NX environment.